[CSH Seminar] Can Women’s Group Farms Outperform Individual Family Farms? Can Women’s Group Farms Outperform Individual Family Farms? Monday, 7 January 2018 from 5:30 p.m. to 7:30 p.m. In the global concern with food security, poverty, and sustainable livelihoods, rather little attention has been paid to the institutional transformation of agriculture. The debate on farm types has focused largely on small family farms vs. large commercial farms. Equally, few programmes for economically empowering rural women focus seriously on farming—the one occupation in which women in largely agrarian economies have most experience. In this context, two initiatives in the 2000s—in Kerala and Telangana—stand out, both because they sought to improve women’s livelihoods within agriculture itself, and because of the innovative institutional form they adopted, namely group farming. This could also potentially provide an alternative model of farming. Based on her primary surveys, Bina Agarwal examines whether pooling land, labour and capital and cultivating jointly, enables women farmers to overcome resource constraints and outperform individual family farmers in the same regions, in terms of productivity and profits. Moreover, given their different approaches, which state is more effective and why? The striking performance of Kerala’s all-women groups, especially in commercial crops, demonstrates the potential of this model of farming. It also challenges popular assumptions that group homogeneity is essential for successful collective action. Bina Agarwal is Professor of Development Economics and Environment at the University of Manchester, UK, and former Director of the Institute of Economic Growth, Delhi. (!) All French diplomatic territories being under protection, registered persons shall not forget their ID proof to be granted access to CSH. 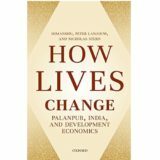 Himanshu H., Lanjouw P., Stern N. (2018) How Lives Change: Palanpur, India, and Development Economics. CSH Delhi © 2019. All Rights Reserved.